Our study is a preparatory exercise. We focus on the analysis of uncertainty in greenhouse gas emission inventories. Inventory uncertainty is monitored, but not regulated, under the Kyoto Protocol to the United Nations Framework Convention on Climate Change. Under the Convention, countries publish annual or periodic national inventories of greenhouse gas emissions and removals. Policymakers use these inventories to develop strategies and policies for emission reductions and to track the progress of these policies. However, greenhouse gas inventories contain uncertainty for a variety of reasons, and these uncertainties have important scientific and policy implications. For most countries, the emission changes agreed under the Protocol are of the same order of magnitude as the uncertainty that underlies their combined (carbon dioxide equivalent) emissions estimates. Here we apply and compare six available techniques to analyze the uncertainty in the emission changes that countries agreed to realize by the end of the Protocol’s first commitment period 2008–2012. Any such technique, if implemented, could “make or break” claims of compliance, especially in cases where countries claim fulfillment of their commitments to reduce or limit emissions. The techniques all perform differently and can thus have a different impact on the design and execution of emission control policies. 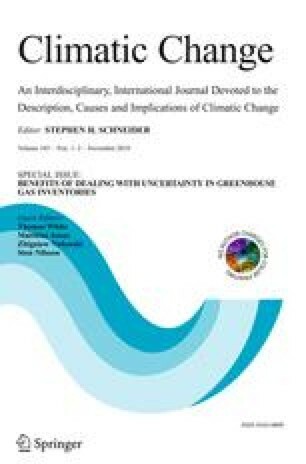 A thorough comparison of the techniques has not yet been made but is needed when expanding the discussion on how to go about dealing with uncertainty under the Kyoto Protocol and its successor.